Shannon is the Founder of SC/PT™, one of the most sought-after Health & Fitness services in London. His high-energy, ‘cut-to-the-chase’ style keeps his audience energised, informed, and highly empowered. Shannon’s motto is “everything counts”, and he has a natural ability to inspire participants to take real action, producing real results and improving lives. Shannon believes that living this way is possible for all of us, if we only learn and incorporate a number of key principles into our lives. 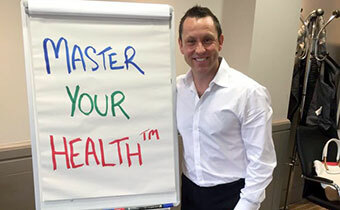 With this in mind, and to empower us all, Shannon has created the ‘Master Your Health™’ 5 hour event, an event in which he will not only teach you his key principles, but also how to incorporate them into your life, aligning your health to your lifestyle, and making a massive impact on your everyday results. “Shannon’s seminar doesn’t provide a quick fix solution or a one-size-fits-all approach, but draws your focus to different ways you could improve yourself – all leading back to your overall health and well being, and whatever your personal goals in life may be. I’m happy to report that I picked up a few great tools that could easily transfer into anyone’s lifestyle, and would recommend his seminars (and his personal training for that matter) to anyone looking to improve him or herself – even if you haven’t yet put your finger on exactly what it is you might like to achieve. Are you ready to take this powerful step towards maximising your health and wellbeing? Take action NOW by securing your seat below.